Thank you, our generous donors, for your help in enabling the families of Notre Dame’s students to access tuition scholarships to provide a Catholic education for their children. Notre Dame Jr./Sr. High School offers several scholarships which are available to eligible students or families, many of which are listed on our Notre Dame common application form. Additional forms are provided for the Hazel D. Scheidelman Scholarship through the Good News Foundation of Central New York Inc., Marian Club of Notre Dame Scholarships, and St. Francis deSales Alumni Association Scholarships. We are providing online applications for all scholarships listed. To qualify for most of these scholarships applicant must have applied for tuition assistance (please note individual forms for requirements). 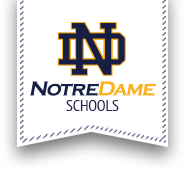 The Notre Dame Scholarships, Marian Club Scholarships, and St. Francis deSales Scholarship must be submitted to Notre Dame by April 1st. The Hazel D. Scheidelman Scholarship application must be returned to the school by April 8th.